Ian Williams and his GAC Pindar team today claimed the M32 European Series warm-up event in Sanremo with a race to spare, at least. The British six time Match Racing World Champion and defending M32 European Series champion and his crew of Richard Sydenham, Pete Nicholas and Will Alloway led from day one of this three day event. This was despite a late challenge from young Swede Nicklas Dackhammar, standing in as helmsman on Cape Crow Viking for Aston Harald boss Håkan Svensson, which saw Dackhammar taking the fight to the British in prestart of today’s first race. “It certainly wasn’t easy out there – conditions were very tricky,” said Williams who claimed the latter two of today’s three races. “Mattias [Dahlström] made a great job of getting the racing off just as the breeze came in and we had three great races. On GAC Pindar we are really happy. With racing scheduled to start at 1200, an hour earlier today, there was a wait out on the water. However the moment the flags on the race committee boat began to stir, Class Manager and Principal Race Officer Mattias Dahlström went into sequence for racing to begin. Today’s first race saw the fourth of the five teams claim a bullet. 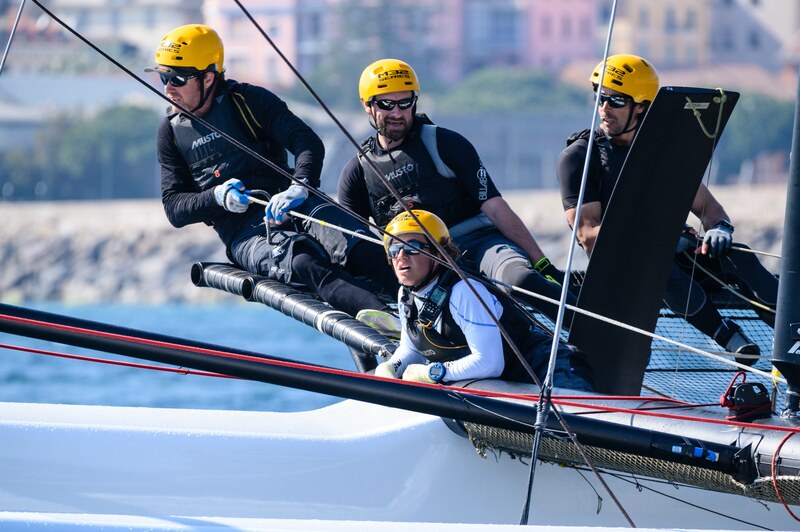 Andrea Vacchino only took the helm of Guido Miani’s Team Shark for this event, but as a sailor who heralds from Sanremo he was pleased to have won on this high performance class on his home waters. “It completed the weekend!” Vacchino enthused. “It was pure excitement. I think I am a bit more competitive in light winds as I could really play. As the wind built, the other boats got stronger.” In the race they won, Team Shark benefitted from three boats being called OCS and being obliged to drop behind. “In these short races it is important to be first at the reaching mark and at the downwind gate, because after that it becomes a positioning race. But I was feeling the pressure!” Vacchino concluded. While GAC Pindar was again the winning boats of the day with a 2-3-3, second top scorer was Youth Vikings Denmark, skippered by former Hobie 16 World Champion Daniel Bjørnholt. “Yesterday we felt we were sailing consistently, but just at the back,” he admitted. “Today we weren’t finishing right at the back and we were getting into the mix. It was still close, but we were able to get slightly better starts and were gybing better. 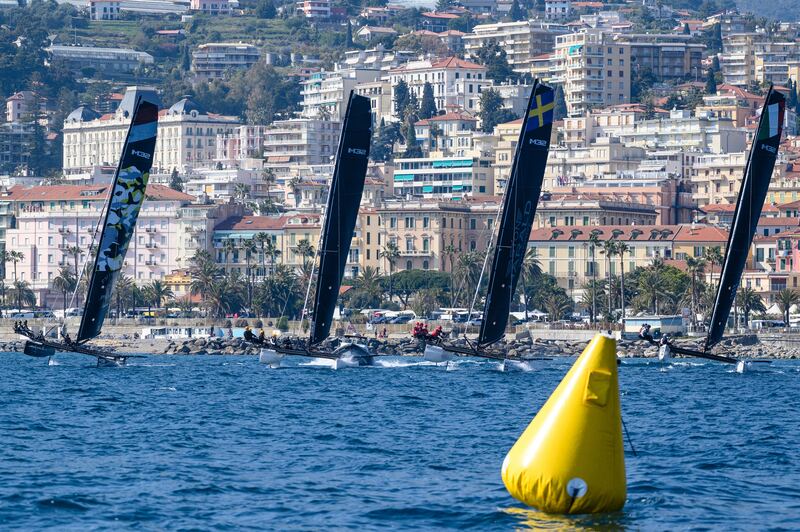 “The weather has been so nice here in Sanremo and the racing too. We got in 13 races which was very efficient, like it always is with Mattias [Dahlström].” And it seems Youth Vikings Denmark have been invited back to sail the ‘development boat’, generously supplied by M32 builder Aston Harald for this season, in Pisa in May. Having won two races of the 13 sailed here, Richard Göransson’s Inga Racing Team was also punching above its weight, this being the Swedish team’s first event in the nimble M32 catamaran after years in the Farr 30 and Melges 32 and 40. 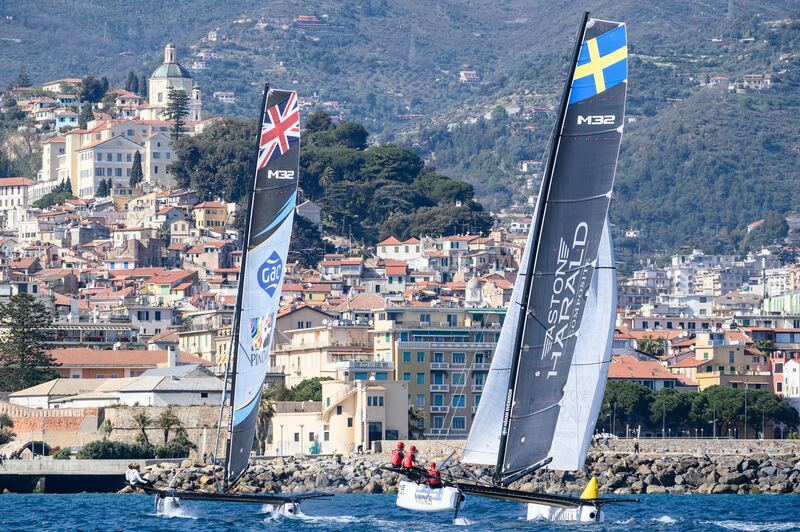 The M32 European Series begins properly in two months’ time, with the first of five scoring events taking place in Pisa, Italy over 24-26thMay. No doubt those that competed in Sanremo this weekend will start with an advantage.